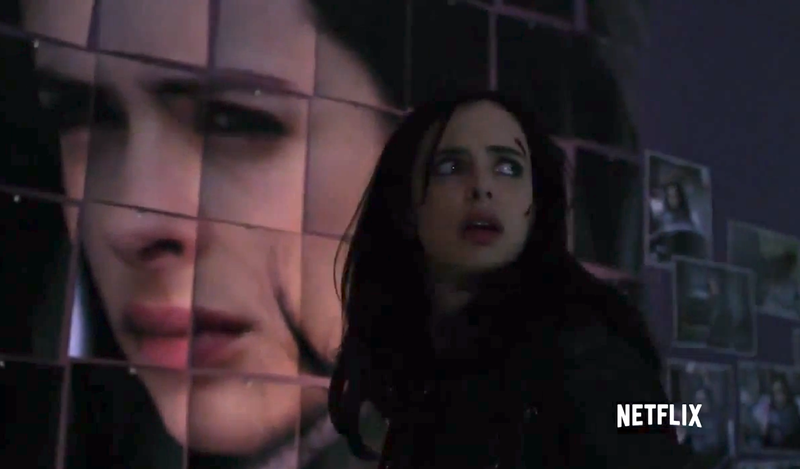 After weeks of mini teaser clips – yes, I refuse to call them trailers as others have – we FINALLY get our first and probably only Full Trailer of Jessica Jones. If you haven’t been following along with the news updates, casting or my articles, then this was your first time in getting to know who/what Jessica Jones is. And if you already did know, then this trailer did not disappoint one bit. So let’s Analyze this trailer and see just how much darker New York is about to get. When we first meet Jessica, she seems to be your average private eye – chasing down leads and helping people she can. Although there’s much more to Jessica than meets the eye as it turns out she used to be a hero. Punching through walls, leaping tall walls, stopping a moving car – slow moving car – she’s got it all. Except of course, what she doesn’t have is peace of mind. As Luke Cage (Mike Colter) says, “Being a hero just puts a target on your back”; and no one knows that more than Jessica. You see Jessica originally used her powers to be just that – “a hero” – but it placed a target on her and the hunter was the worst man imaginable, a man by the name of Kilgrave. As if the name wasn’t a hint, Kilgrave (played by David Tennant) is not someone you want to play around with. In fact he has one of the few abilities that super strength can’t protect against, mind control. We’ll learn in flashbacks that Kilgrave manipulated Jessica and not only made her kill for him but also abused her for a long time. This is why she drinks and has anger issues. She is running from her past and never knows when it might come back to haunt her. And of course, it does. From the moment we meet Kilgrave, we see his ability is powerful mind control. It’s not even prolonged hypnosis as we see a simple remark is immediately followed. As the trailer continues we see that his powers are just limited to one person, but possibly anyone within earshot as we see multiple scenes of cops pulling guns on each other and people willingly hanging themselves. He will stop at nothing to get Jessica back; but why the obsession. Well Kilgrave feels that he and Jessica are meant for each other. He provides the intellect and she provides the muscle, and he wants that back. What this trailer did wonderfully is match the charming side of Kilgrave with the abusive psychotic side. When we first hear Tennant’s voice – and hell, it’s David Tennant – we’d invite him in as well. Although Kilgrave’s charm was always matched by his abuse of Jessica in the comics – both verbally and physically. This is why we hear/see him screaming so loudly at her. This was a usual occurrence in the comics that we’re sure to see here in flashback. In fact, we even see allusions to one of the most famous Jessica Jones/ Purple Man comic panel. The other important thing to note stylistically about the trailer and series is the use of the color purple. In the comics, Kilgrave was also known as the Purple Man – yes he had purple skin. I’m happy they didn’t take that route with Kilgrave here – much like how they didn’t give Fisk invulnerability in Daredevil – but the purple will be referenced in clothing and lighting. Although the purple isn’t just for Kilgrave as it also works for Jessica Jones, who in the comics was known as Jewel in her costumed super hero days. And you guessed it, as Jewel her hair and parts of her costume were Purple. Beyond Jessica and Kilgrave, we of course meet the supporting cast – some who may be or become familiar. 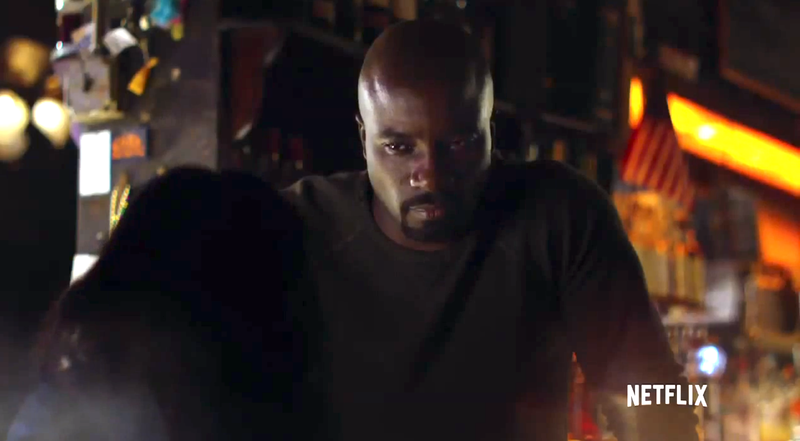 We get to meet Jessica’s best friend Trish Walker (played by Rachel Taylor) as well as a friendly bartender named Luke Cage. Luke will of course go on to be Jessica’s romantic interest and another one who knows her secret; but it doesn’t end there as Luke will become the focus on the next Netflix series. At the moment, it’s unclear whether Luke has his powers already or if he’ll acquire them in this series. Although judging by his opinion of heroes having targets placed on them, he might already be ‘Power Man’. Beyond these new faces though the series will also feature some allusions and tie-ins to Daredevil. In the prequel comic by Marvel handed out at New York Comic Con we find Turk Barrett back – possibly for the last time – and also see how Claire Temple (Rosario Dawson) will return as the night nurse. As far as the ’Man Without Fear’ himself, I’m willing to bet there’ll be a brief cameo of either him or Murdock late in the series – but we do hear that Jessica wants to meet him in the comic. All in all, this trailer has the exact same vibe as the Daredevil. At first one might wonder how they could make it a full series; but as the trailer continues we see all the struggles to come. In fact, I’m willing to say that this trailer shows even more drama than the Daredevil one; but it’s also important to admit that just because this is the same universe doesn’t mean the feel will be the same. There will be crossovers but this won’t be ‘Daredevil with a female lead’. This show will be similar but have its own tone and style – and be much darker! So know what you’re getting yourself into; but also know that by the end you’ll see just how strong a heroine Jessica Jones is. Jessica Jones premiers on Netflix November 20th. And be sure to stay tuned here in the week following the premier as I’ll be writing up a Season 1 Primer/Spoiler Free Review, Season 1 Analysis, Season 1 Easter Egg Guide & NYC Comparison article just like I did for my Netflix Daredevil coverage.